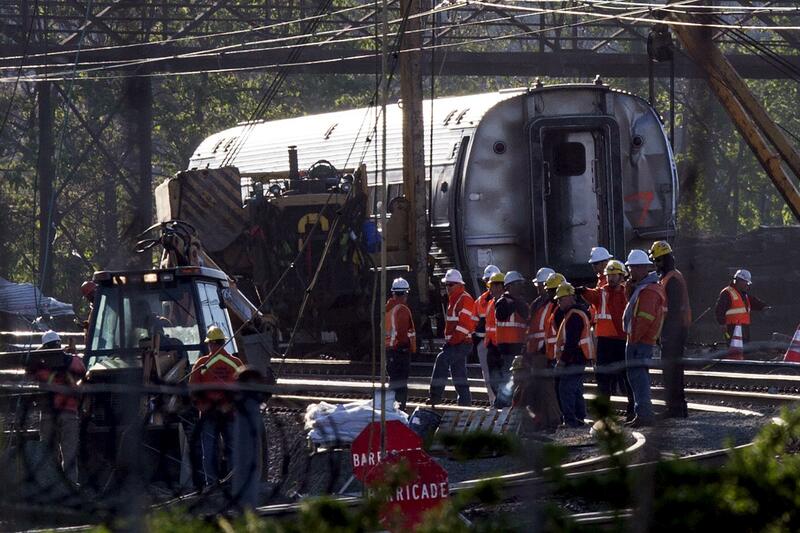 Philadelphia Amtrak crash: Another death reported. The Amtrak crash site in Philadelphia. Update, 12:05 p.m: The Philadelphia Inquirer reports that the body of an eighth individual killed in Tuesday’s crash has been recovered. Investigation of the crash site is expected to continue throughout the day Thursday. Original post, 9:32 a.m.: With several reports indicating that the Amtrak train which crashed in Philadelphia Tuesday night was traveling at over 100 miles per hour as it reached a curve with a speed limit of 50 mph, Philadelphia mayor Michael Nutter has come to a conclusion that many others likely have as well: that the train’s engineer is probably at fault. “Clearly it was reckless in terms of the driving by the engineer. There’s no way in the world he should have been going that fast into the curve,” Mayor Michael Nutter told CNN. “He remembers coming into curve. He remembers attempting to reduce speed and thereafter he was knocked out,” Goggin said. He said Bostian does not recall using the emergency brake, which investigators said was applied moments before the crash. The lawyer said the last thing the engineer remembered was coming to, looking for his bag, retrieving his cellphone and calling 911 for help. He said the engineer’s cellphone was off and stored in his bag before the accident, as required. A LinkedIn profile for Bostian, who’s 32 and lives in Queens, says he has been an Amtrak engineer since 2010 and worked before that as an Amtrak conductor.